A Global Citizen's 'WASH libraries' teach kids to read, wash their hands, and manage their periods. The weekend after Nguzo Ogbodo, an attorney living in New York City, moved to Nigeria with her family to study the country’s legal system, her daughter Chelsea had one important question. “We’re not going to the library?” Chelsea asked. Almost every Saturday, Ogbodo, 38, had taken her children to a library near their home in the Bronx, but no such place existed in their new community. In fact, there were few libraries for children in the whole country, Ogbodo informed her daughter. Her daughter’s passion inspired Ogbodo, who was born in Nigeria but attended school in the UK before becoming a US citizen, to build libraries in her native country through her organization The Hope and Dreams Initiative. “I said to myself, if a 6-year-old can think of this then, I, a mother who believes that reading is lifetime empowerment, can do it,” Ogbodo told Global Citizen. The mission thrilled Chelsea, who promised Ogbodo a special treat if she followed through: a visit from her hero, Michelle Obama. 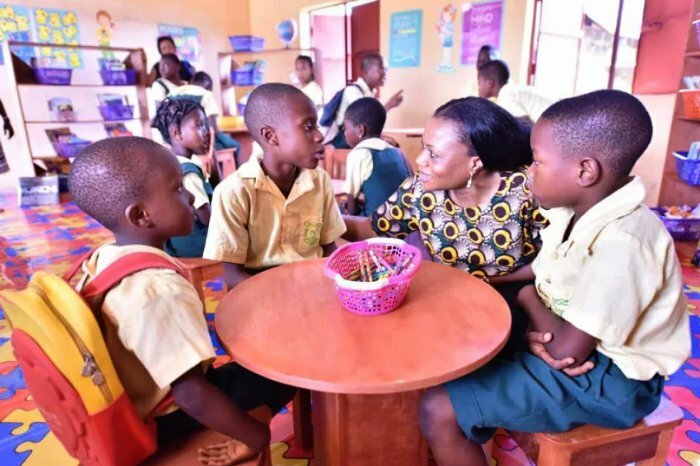 Since Ogbodo founded The Hope and Dreams Initiative seven years ago, she has completed nine libraries, with three more in development, at schools around the country. And while the former First Lady has yet to stop by, hundreds of kids have visited and benefited from the spaces. Her work does not end at providing books and reading spaces for children, however. Ogbodo’s initial mission quickly expanded after she began to observe life at a school in the Delta State, located in Southern Nigeria. There she noticed that children often arrived at school dirty and returned from the bathroom with dry or soiled hands. When she asked one student why he had not washed his hands, the boy told her there was no wash basin and no water. Ogbodo also noticed that girls were missing school at an alarming rate. She asked the teachers, but she said they seemed unwilling to speak frankly about why girls were skipping class. Most of the girls used tissue paper or dirty rags to manage their periods. They often skipped school because there was no clean water and no toilet to safely change their homemade hygiene products, Ogbodo said. Periods remain taboo in Nigeria and many countries around the world, where menstruation affects school attendance for girls. In Africa, one in 10 girls miss school when they have their period, according to UNESCO. According to UNICEF, there is one toilet for every 600 students at most schools in Nigeria and a 2010 report found that 42% of school-aged girls, as well as 36% of school-aged boys, in Nigeria were not attending school. Global Citizen campaigns on providing access to clean water, safe sanitation and menstrual hygiene products for everyone in the world and on ensuring that all children have access to education. You can take action here. To Ogbodo, the two experiences demonstrated how a lack of water, sanitation, and hygiene (WASH) affect education. That realization inspired her to create environments where children could access clean water, soap, and sterile menstrual hygiene products as well as books and magazines. What started as a temporary move to Nigeria became a lifelong “burden” after she returned to the US a year later in 2011, she said. Ogbodo calls them WASH libraries because they educate children about menstrual hygiene, clean water, and safe sanitation practices — the tenets of WASH. Since Ogbodo spends most of her time in New York City, where she visits museums, meets with friends, and works as contract attorney at a Midtown Manhattan law firm, she enlisted two teachers at each school to run the libraries. She also hired someone to check on each of the libraries every few weeks. Twice a year, Ogbodo visits the libraries, hauling containers full of supplies. She and her husband Chikwude, an accountant, have spent about $10,000 outfitting the libraries with books, sanitary pads and other materials, she said. Each library contains a sink, several posters about hand-washing, a supply of sanitary pads and one feature particularly special to Ogbodo — a collection of Babysitters’ Club books, her favorite series growing up. Ogbodo said she wants children in Nigeria to have the same opportunities that she had growing up in the UK and that her daughters Chelsea and Nora and her son David now experience in the US. “I decided to start these libraries to give back to my community because who I am today is a a product of growing up in Nigeria." Ogbodo said she also wants to enable every menstruating girl to stay in school and to relieve the financial burden posed by sanitary pads, which are too expensive for many families to purchase. Her libraries could go along way toward accomplishing that mission.